When I was younger I always preferred savoury food over sweet, but since working in restaurants and learning to make proper desserts I have come to have a greater appreciation for them. In expanding my culinary repertoire I will embrace all types of food equally, both sweet and savoury! 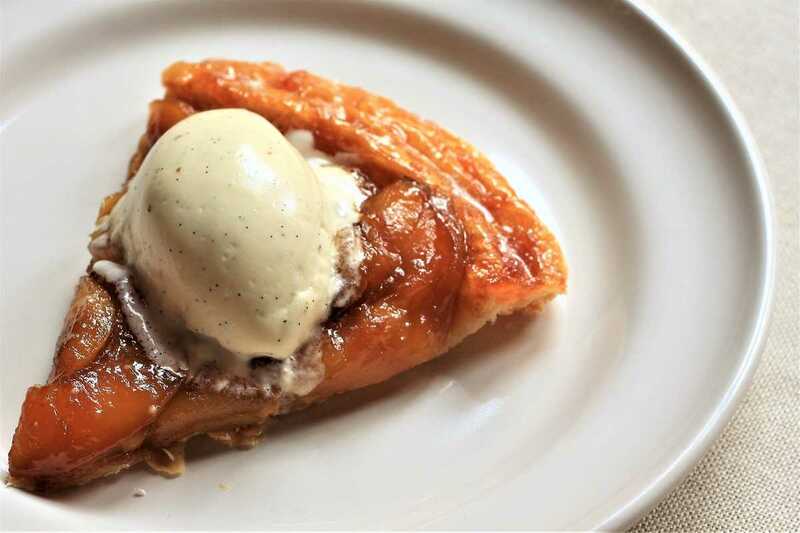 Tarte Tatin is a dessert that we used to do for lunch at Wedgwood; it’s a classic French dish, delicious and quite easy to make. As with a lot of food I love, I really appreciate the simplicity of it. The combination of rich sweet caramel and tart apples is balanced beautifully by the smoothness from the butter; these are flavours that were made for each other. It’s the prime season for apples right now so this is a good time to make it! I’ve never tried making puff pastry from scratch before, as I know it’s a time consuming process, but I’d like to do it some time. I’ll put a recipe up on here when I do, but for now I’m just using ready-rolled pastry from the shop which is of pretty good quality anyway and saves a lot of time. Just four ingredients make up this amazing dessert: apples, sugar, butter and puff pastry. As for the apples, a tart eating variety is needed – I recommend Cox as the best option as they have a great flavour and also hold their shape well when cooked instead of turning mushy. Since it’s such a simple dish, the quality of each individual ingredient is more important so I would suggest getting a block of some really nice expensive butter for this. Desserts are a luxury anyway so you might as well do it properly! Heat the oven to 180C. Put the caster sugar in an even layer into a metal handled frying pan (approx 20cm diameter) and place over a low heat until the sugar has caramelised to a uniform golden brown. While the sugar is heating, peel, core and slice the apples into eighths. Roll out the puff pastry to about 2-3mm thickness and cut a circle about 1/2 an inch wider than the inner diameter of the frying pan. Cut the butter into small dice and set aside. Once the caramel is ready, add the butter in a even layer followed immediately by the apples, rounded sides down. Leave to cook for 2 minutes until the caramel has softened and the butter has melted. Cover carefully with the puff pastry and tuck the edges in. Prick the top several times with a sharp knife to allow steam to escape. Now place in the oven for 15 minutes until the pastry is cooked through, nice and golden. Have a cooling rack ready; remove the tarte from the oven and leave for 1 minute, then quickly turn it out onto the rack upside-down. The caramelised apples should release from the pan nicely. Leave to cool slightly, then eat! Excellent with vanilla ice-cream.